There are surely thousands of recipes for meat loaf, from the most basic off the side of the oatmeal box to elaborate stuffed and gravied creations. My friend Diane B once wrote a funny article about her “man loaf” recipe for a meat loaf stuffed with an Italian sausage, served with a side of cardiac arrest. I prefer to make my meat loaf on the boring side with onion soup mix and breadcrumbs. 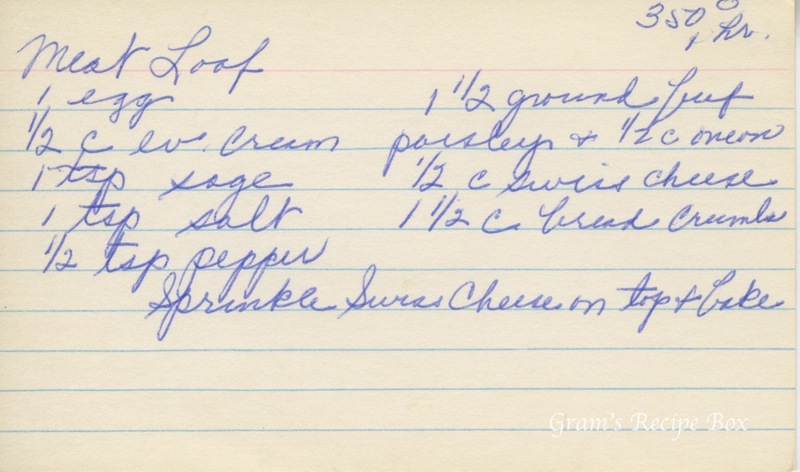 My mother always made baked potatoes along with meat loaf. However you prefer to make yours, enjoy! Meat loaf is the homey comfort food of America. Okay, it’s not “man loaf,” but it looks similar to mine, minus the sausage and side of cardiac arrest. My least favorite part of meat loaf is it tends to either be dry or too mushy. This looks like it would have a good balance with the nice addition of swiss cheese.